Latest news of Chinese military, Chinese military analysis. In the Iraq war, the U.S. military staged a new century's most dazzling show the battlefield. The war in the United States military forces beyond the conventional approach to the world was impressed, so many military experts stunned, address him read. But the United States and British forces has been able to drive straight, quick, armored units should be established combat and rendered meritorious. No M1A1, Challenger II, M2A2, M2A3 tanks and Warrior armored vehicles and other large ground-fast attack: the U.S. the British would not be in such a short period of time to win a decisive victory. Looking battlefield confrontation, the Chinese-made Iraqi tanks 69 tanks against the allied forces under the almost vulnerable, destroyed Iraqi tanks and armored forces, indeed, greatly shocked to high-level Chinese military. The face of the twenty-first century high-tech military technology and equipment, particularly the Army's main battle tanks and equipment, not to catch up with the pace of the world, it very difficult to adapt to modern warfare. Development of main battle tanks, is to enhance Army combat an urgent task. After half a century of efforts, China's main battle tank technology has made great progress, from initial development to be developed by copying the world's advanced level of main battle tanks. For a long time, our tanks traces of imitation of the former Soviet heavy tanks, until recent years gradually from the former Soviet Union, mortar nests, a Chinese flavor becomes concentrated. A new type of 88B, 88C (96-type) and 98 tanks is clear evidence of this. In particular, the Type 98 main battle tanks in firepower, mobility and protection of the unity achieved very good, with very good technical and tactical, the famous British "Jane's Defense Weekly," said the Type 98 is the world's most advanced tanks is also one of China's most advanced main battle tanks. China 99 new style tanks, known as China's Marine ace of the third generation main battle tanks. She is proud of China's defense industry, with superior ballistic shape, its turrets and body are of composite armor, bullet-proof improved several times, is our military armored divisions and mechanized infantry division of the main assault force. 99 125MM guns firing kinetic energy penetrators in time, penetrate 1100MM of homogeneous steel armor, and artillery for the Leopard 2 L55120MM 960MM, 120MM artillery of the U.S. M1A2 is 910MM, so that 99-style firepower in the world. Second, an advanced protective armor is equivalent to the first 99 600MM of homogeneous armor, reactive armor installed after the equivalent of 960MM homogeneous armor, Leopard 2 is 750MM, United States 720MM. 99 protection is quite good. Third, superior maneuverability 99 1000 hp engine, the maximum speed of 65KM / H, although not excellent, but 99 changes in the upgrade to 1500 horsepower, maximum speed upgraded to 80KM / H is almost the limit for the three generations of tanks, the world's first . 4, advanced fire control: Some people say Japan 90 tank fire first, but after reading Beijing Defense Exhibition, the myth has been completely reversed! North study of the fire control system with automatic tracking and closed-loop, real world. 99 very advanced fire control will have been reached or exceeded the world's advanced level (88B are dynamic on the move 90%)! In summary, the third-generation main battle tanks around the world in the rankings, China ranked second after the United States should no one would dare say that lying to. 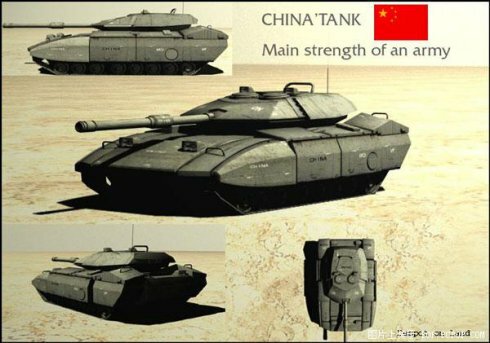 However, China's military elite never far behind, and according to reliable sources and foreign military intelligence said: Following China's officially out 99 tanks installed after the People's Liberation Army, its next-generation (fourth generation) of all composite materials research for the CN-code M's new concept has surfaced tanks, according to relevant experts, the new tank along the extensive use of carbon fiber composite material La, vehicle total of 25 tons, using the new dual-cam engine ramjet engine, maximum power of 3800 hp speed up 180KM / h, 0 ~ 100KM accelerated time only 8S, the world's highest dynamic system indicators, is daunting. CN-M pre-armor thickness 580MM, 1350MM the homogeneous equivalent thickness of steel, plug-needle armor explosive reaction, so that the defensive capacity of vehicle an unprecedented level. Turret at the top of cone design, high-intensity C60 polymer laying tile explosion can effectively fight against anti-tank missile hit the top attacks. CN-M with closed-loop adaptive self-loading machine, shells can be filled at any point of view, filling time of 80 rounds / sec. CN-M uses a W99 type storm machine gun (Beitan 50,000 rounds), the maximum rate of fire of 100 rounds / second turret on each side of eight infrared smoke generator. Roof is equipped with two laser dazzling against the system, with the vehicle laser radar can simultaneously track 48 moving targets, and automatically select the 16 most dangerous targets for interference. CN-M tanks with advanced laser stabilization, fire control system, its turret left rear of the combined quantum optical systems, including laser thermal imager and laser rangefinder. It appears that our tanks have night vision capabilities night aiming revolutionary progress. CN-M tank battlefield using advanced data sharing system, you can tank up to 2048 simultaneously, and also to exchange of battlefield information, through the vehicle speed embedded computers for distributed computing, network, may decide by a computer distribution and control tanks fire their state of motion . CN-M tank is expected to be the first official series in 2015 mounted troops, the army will be fighting countries would have a profound impact way, the U.S., Germany, China plans new generation of tanks of deep concern, and actively seeks to address the Road, look forward to the future with the opponent's combat luminescence lose too hard.